It seems that often when a new service from Internet giants such as Google or Facebook is launched, all the cool features are primarily US-centric with the rest of the world left high and dry. Hence, it is quite surprising to see Google offering an exclusive feature to Indian Google+ users through which they can update their stream using text messages. 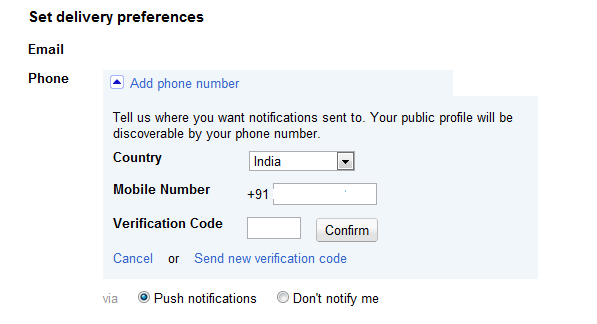 To update Google+ through text messages, you will have to initially add your phone number in Google+ settings, following which Google will text you a verification code which has to be added in the Google+ settings. Optionally, you can also add a security PIN for extra security and avoid spoofing of text messages. 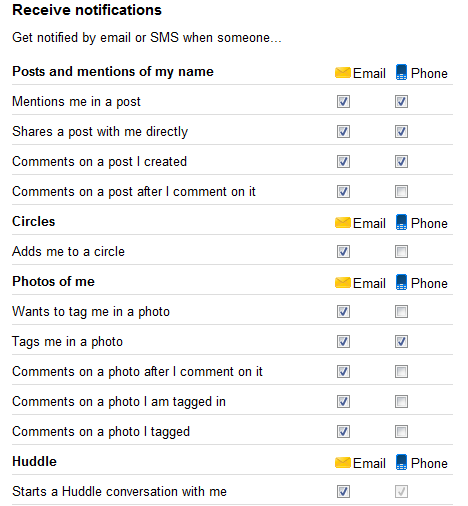 Further, you can also modify the notification settings so that you can be notified by any specific activities on Google+ such as mentioning your name, commenting on your post, adding you to a circle, tagging you in a photo and more. While these notifications are also available to US users, Indian users get the additional benefit of being able to post into their Google+ stream by texting a message to 9222222222 at no extra cost. This update will be visible to all your circles by default and you will be charged as per the standard message rates from your carrier. To share with a specific circle, append your post with @[circle name]. For example: “Will see you at the game @soccerfolks”. To share with everyone in your extended circles , append your post with @extended. For example: “Any SF restaurant recommendations? @extended”. To share your post publicly, append your post with @public. Public posts are viewable by anyone on the web. For example: “Any SF restaurant recommendations? @public”. To share your post with a specific person, append your post with @[email address]. For example, “In SF for the week @jazzguitar9@gmail.com” will be visible to jazzguitar9@gmail.com. Quite honestly, it does make a lot of sense to offer SMS posting capabilities to Indian users since smartphone penetration is still pretty low and a lot of users still rely on SMS to converse with their friends/family. That aside, Facebook has also tried to tap into this market over the past few years with several initiatives such as Facebook Zero and Facebook text messages, but it has very few mobile operators onboard whereas this SMS feature from Google seems to be carrier-agnostic, which could provide an competitive advantage to Google in the forthcoming months.